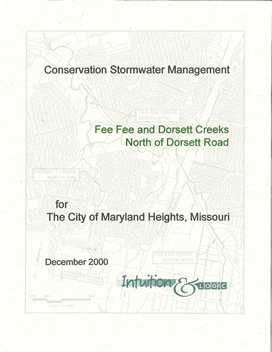 The Fee Fee and Dorsett Creek North of Dorsett Watershed Masterplan was the last of three watershed masterplans developed by Intuition & Logic for the City of Maryland Heights over the course of a multi-year, multi-phased watershed analysis of the three major stream networks within the city limits. The three masterplans evaluated over 20 miles of stream and tributaries for Midland Creek, Fee Fee Creek and Dorsett Creek. 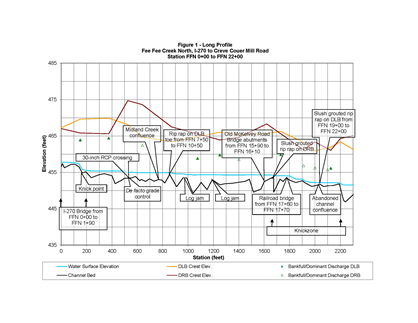 The analysis identified current and historical drivers for the observed channel instability and the capital improvement project recommendations were developed to address local and systemic channel instability. Intuition & Logic was the prime consultant leading the team to develop the three watershed masterplans. 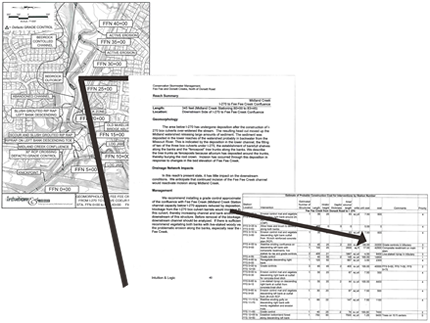 Each masterplan included the collection and evaluation of fluvial geomorphic data; long profile survey and analysis; stereoscopic historical aerial photo analysis; diagnosis of dominant process; capital improvement project development with projected costs and prioritization; guidelines for the use and design of bio-engineered channel stabilization techniques; and production of the Watershed Masterplan document.